Options are a low risk trading tool in Derivatives or Futures & Options segment. They carry significantly lower risk as compared to Futures Trading. They are also popular because trading with Options does not require large capital. Though it looks like Options are cheap to trade but are they really? We will find out next and how to find a cheap Option to make your trading profitable. This is because in Options Trading, you can not loose more than the ‘Premium’ you pay to buy an Option. Here your reward or profit potential is unlimited. Of course, while writing or selling Options, it is the other way around. Find out if buying an option is more profitable or writing an option. Popularity of Options among the market traders is because of requirement of less capital to take a trading position in the market and the lower risk. Although most of the traders are aware of these benefits of Option Trading and are regular Options traders, even then it is a fact that are not as much familiar with Option Pricing as they should be. Option Pricing depends upon several factors like Stock or Underlying market price, Time Value, Volatility, Interest Rates and some Greek letters. We are not going into much details of that here. 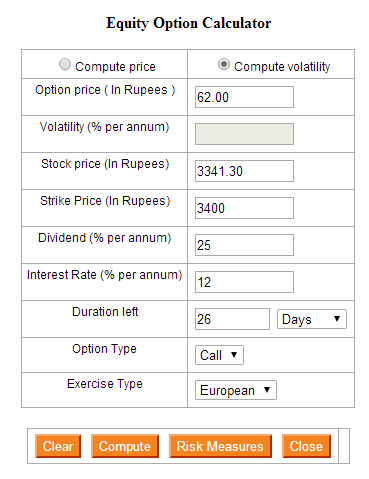 You can certainly use an Option Calculator to calculate the Option Prices. While talking about the Option Pricing, the aim of a trader is to buy an Option at a Cheap Price and sell it at a higher price. Which is The Cheap Option? How is it a Cheap Option? The above image shows the Option Chain for stock of State Bank of India (SBIN), taken from the National Stock Exchange (NSE) website. The stock was trading at ₹ 2441.65 on August 1, 2014. Suppose we expect the stock to move to ₹ 2500 in next few days and we need to buy a Call Option. So which Option is Cheap to buy among the different Strikes available, from 2400 to 2550? Possibly most of us shall be thinking of 2540 or 2550 because the Premium needed to buy the 2550 Call Option is 125 (Lot Size) x 55 (Current Call Price) = ₹ 6875. This is quite less compared to lower Strikes such as 2400 where it can be 125 x 124 = ₹15500. For 2450 Call Option it is 125 x 96.75 = ₹12093.75. 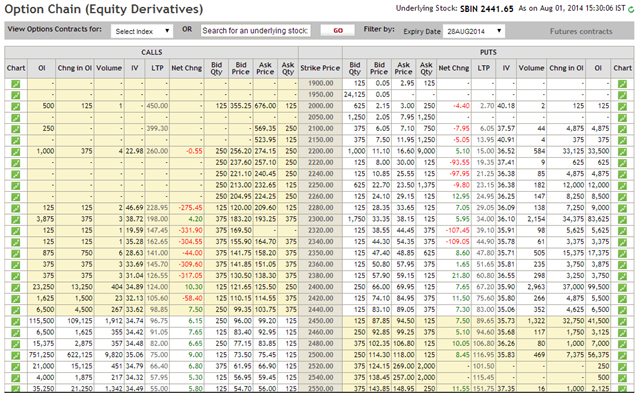 If you are thinking that 2400 Strike Call is Cheaper to buy in comparison to 2450 or 2550, you are going great. The Intrinsic Value of an Option is the inherent value in an Option. This is the price which is valid even after the expiry of the Derivatives Contract. This is credited back to the Option buyer after Contract Expiry. Some people believe that all Options become Zero on Expiry. This is not true. Only Out of Money Options become zero while all In The Money Options retain their Intrinsic Value and the corresponding amount is paid back to the ‘In the Money’ Option holder. Intrinsic Value :- 2441-2400 = 41. If the stock expires at 2441 on Contract Expiry, the option buyer will get back ₹125 x 41 = ₹5125 out of ₹15500 paid while the rest of the premium will be washed out. ‘Out of the Money’ Options have Zero Intrinsic Value. For all Call Options, the Call Strikes seen lower than the current stock price have Intrinsic Value. Similarly, for all Put Options, the Put Strikes above the current price of a stock are ‘In the Money’ Options. In the above figure all Put Strikes of 2450 and above are ‘In the Money’ Put Options. To make it easy to differentiate, the NSE has shown it in different colors. The Yellow portion on the left side in the figure shows ‘In the Money’ Call Options while the White portion shows ‘Out of the Money’ Call Options. On the right side, the Yellow portion shows ‘In the Money’ Put Options and the White portions shows ‘Out of the Money’ Put Options. The Premium reflects only the time value. The ‘Out of the Money’ Options near the current stock price have high premium compared to farther Strike Prices. This is because the probability of stock price reaching the near Strike Options is quite high. Now that we have understood the Option Pricing, we come back to our above example of 2400 and 2450 Call Option for which we calculated the Premium as ₹15500 and ₹12093.75 respectively and we wanted to find the Cheap Option. Thus we see that for 2450 Call Option, we are paying additional ₹13.75 as premium and it is only the Time Value of the Option and it will go on decreasing as the Contract Expiry approaches near. Before buying Options, it imperative that we choose the right Option by analysing the Option Price. Don’t keep accumulating Out of the Money Options with low prices just thinking that they are too Cheap to buy. In fact, they are not Cheap but costly. The probability of the underlying security going there is low and the price of those Options is only because of Time Value which goes on decreasing with each passing day and you may end up loosing all the Premium you paid to buy those Options.